Once upon a time long, long ago, two ambitious young cousins named Pablo and Bruno lived side by side in a small Italian village. The young men were best buddies, and big dreamers. They would talk endlessly about how someday, someway, they would become the richest men in the village. They were both bright and hard working. All they needed was an opportunity. One day that opportunity arrived. The village decided to hire two men to carry water from a nearby river to a cistern in the town square. The job went to Pablo and Bruno. Each man grabbed two buckets and headed to the river. By the end of the day, they had filled the town cistern to the brim. The village elder paid them one penny for each bucket of water. "This is our dream come true! "Shouted Bruno. "I can't believe our good fortune." But Pablo wasn't so sure. His back ached and his hands were blistered from carrying the heavy buckets. He dreaded getting up and going to work the next morning. He vowed to think of a better way to get the water from the river to the village. "Bruno, I have a plan," Pablo said the next morning as they grabbed their buckets and headed for the river. "Instead of lugging buckets back and forth for pennies a day, let's build a pipeline from the village to the river." Bruno stopped dead in his tracks. off and two weeks paid vacation every year. We're set for life! Get out of here with your pipeline." But Pablo was not easily discouraged. He patiently explained the pipeline plan to his best friend. Pablo would work part of the day carrying buckets, and part of the day and weekends building his pipeline. He knew it would be hard work digging a ditch in the rocky soil. Because he was paid by the bucket he knew his income would drop. He also knew it might take a year or two before his pipeline would pay off. But Pablo believed in his dream and he went to work. laughed loudly at his jokes. While Bruno lay in his hammock on evenings and weekends, Pablo kept digging his pipeline. The first few months Pablo didn't have much to show for his efforts. The work was hard, even harder than Bruno's because Pablo was working evenings and weekends too. But Pablo kept reminding himself that tomorrow’s dreams are built on today’s sacrifices. Day by day he dug, inch by inch. Inches turned into one foot........... then ten feet............ then 20............. then 100. "Short-term pain equals long-term gain," he reminded himself as he stumbled into his hut after another exhausting day's work. "In time my reward will exceed my efforts," he thought. "Keep your eyes on the prize," he kept thinking as he drifted off to sleep with the sounds of laughter from the village tavern in the background. Days turned into months. One day Pablo realized his pipeline was half-way finished, which meant he only had to walk half as far to fill his buckets! Pablo used the extra time to work on his pipeline. During his rest breaks, Pablo watched his old friend Bruno lug buckets. Bruno's shoulders were more stooped than ever. He was hunched in pain, his steps slowed by the daily grind. 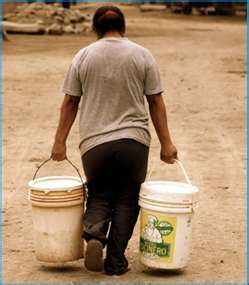 Bruno was angry and sullen, resenting the fact that he was doomed to carry buckets, day in, day out, for the rest of his life. He began to spend less time in his hammock and more time in the tavern. When the tavern's patrons saw Bruno coming they'd whisper, "Here comes Bruno the Bucket Man, " and they giggle when the town drunk mimicked Bruno's stooped posture and shuffling gait. Bruno didn't buy rounds or tell jokes anymore, preferring to sit alone in a dark corner surrounded by empty bottles. Finally Pablo's big day arrived, his pipeline was complete! The villagers crowded around as the water gushed from the pipeline into the village cistern! Now that the village had a steady supply of fresh water, people from around the countryside moved into the village and the village prospered. Once the pipeline was complete, Pablo didn't have to carry buckets anymore. The water flowed whether he worked or not. It flowed while he ate. It flowed while he slept. It flowed on weekends while he played. The more the water flowed into the village, the more money flowed into Pablo's pockets! 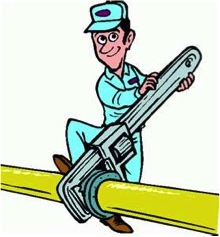 Pablo the Pipeline Man became known as Pablo the Miracle Maker. But Pablo understood what he did wasn't a miracle. It was merely the first stage of a big, big dream. You see, Pablo had bigger plans. Pablo planned on building pipelines all over the world!. The pipeline drove "Bruno The Bucket Man" out of business, and it pained Pablo to see his old friend begging for drinks at the tavern. So, Pablo arranged a meeting with his old friend. "Bruno, I've come here to ask you for your help." Bruno straightened his stooped shoulders, and his dark eyes narrowed to a squint. "Don't mock me," Bruno hissed. "I haven't come here to gloat," said Pablo. "I've come here to offer you a great business opportunity. It took me more than two years before my first pipeline was complete. But I've learned a lot during those two years. I know what tools to use now, and where to dig. I know where to lay the pipe. I kept notes as I went along so now I have a system that will allow me to build another pipeline in less time........... then another........... then another. I could build a pipeline a year by myself, but what I plan on doing is teach you how to build a pipeline, then have you teach others and have them teach others. "Just think, we could make a small percentage of every gallon of water that goes through those pipelines." Bruno finally saw the big picture. They shook hands and hugged like old friends. Years passed. Their world pipelines were pumping millions of dollars into their bank accounts. Sometimes on their trips through the countryside, Pablo and Bruno would pass villagers from other villages carrying buckets. The friends would pull over and tell them their story and offer to help them build a pipeline. But sadly, most bucket carriers would hastily dismiss the notion. "My friend told me he knew a friend who's uncle's best friend tried to build a pipeline and failed." "Only the ones who get in early make money on a pipeline." "I've carried buckets my whole life, I'll stick to what I know." "I know people who lost money in a pipeline scam." Both men resigned themselves to the fact they lived in a world with a bucket-carrying mentality............. and only a very small percentage of people would ever see the vision. Who are you? A bucket-carrier............ or a pipeline builder? Do you get paid only when you how up for work like Bruno the Bucket Carrier? Or do you do the work once and get paid over and over again like Pablo the Pipeline Builder? If you're like most people, you're working the bucket-carrying plan. It's the time-for-money-trap. The problem with bucket carrying is that the money stops when the bucket-carrying stops. Which means the concept of a "secure job" or "dream job" is an illusion. The inherent danger of carrying buckets is that the income is temporary instead of ongoing. If Bruno woke up one morning with a stiff back and couldn't get out of bed, how much money would he earn that day? ZERO! No Work-No Money!